VIDEO: President Buhari welcomes German Chancellor, Angela Merkel to the State House. 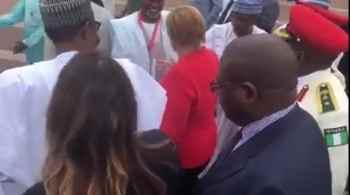 VIDEO: President Muhammadu Buhari welcomes German Chancellor, Angela Merkel to the State House, Abuja. Ahead of her arrival to the State House, Nigerian officials met with German Business Delegation that has accompanied Chancellor Merkel to Nigeria. Minister of Industry, Trade and Investment Okechukwu Enelamah is presiding. The Nigerian Delegation at this meeting includes: Nigerian Ambassador to Germany Ambassador YusufTuggar, and officials from Federal Ministry of Industry, Trade and Investment Nigerian Electricity Regulatory Commission @Nigerian Investment Promotion Commission NIRSAL , National Automative Design and Development Council (NADDC), Nigerian Association of Chambers of Commerce, Industry, Mines & Agriculture NACCIMA and the Nigerian Embassy in Germany. The meeting saw the signing of MOU between the German-African Business Association and the Nigerian Association of Chambers of Commerce, Industry, Mines & Agriculture (NACCIMA). Later, a Business Roundtable, which was attended by President Buhari and Chancellor Merkel, took place. The German – Nigerian Business RoundTable, at the State House brought together German and Nigerian government and business delegations, to discuss trade and investment opportunities between the two countries. Signing of MOU between NIRSAL and Petkus Technologie GmbH, was also witnessed. President Muhammadu Buhari welcomes German Chancellor, Angela Merkel to the State House, Abuja. Ahead of her arrival to the State House, Nigerian officials met with German Business Delegation that has accompanied Chancellor Merkel to Nigeria. Minister of Industry, Trade and Investment Okechukwu Enelamah is presiding. Automative Design and Development Council (NADDC), Nigerian Association of Chambers of Commerce, Industry, Mines 8. Agriculture NACCIMA and the Nigerian Embassy in Germany. The meeting saw the signing of MOU between the German-African Business Association and the Nigerian Association of Chambers of Commerce, Industry, Mines 8. Agriculture (NACCIMA). Later, a Business Roundtable, which was attended by President Buhari and Chancellor Merkel, took place. The German Nigerian Business RoundTable, at the State House brought together German and Nigerian government and business delegations, to discuss trade and investment opportunities between the two countries.